Today running your own website gives you lots of advantages. It’s not just trendy and cool but also very useful. And the variety of modern websites made to suffice different purposes proves this fact. Moreover, an attractive website is the best advertisement for your business. It doesn’t matter what an actual reason moves you to create a website. Anyway, accidentally or intentionally if you’ve found this article and still here, you want to do it by yourself. Well, it’s quite reasonable and real even if you have zero knowledge in coding. Because you always can use some pre-made mock-up, like a theme by one of the leading CMS providers. So, which theme to choose for creating a website? According to a statistic, WordPress and Moto CMS are far ahead of their competitors. 50,000 of daily-born websites are powered with WP. Talking about Moto CMS templates, they have a huge number of ready-to-use HTML templates with a quick switch possibility without losing info. Being user-friendly content management systems WordPress and Moto CMS are highly-recommended for newbies. As for ready-made WordPress themes, they are perfect for everyone who wants to save their time. Thus, both WordPress and Moto CMS deserve your trust. That’s why I’ve gathered different 15 business themes and templates for you. Be sure that they fully meet the aforesaid tips. The most essential is these items don’t require any coding skills. Let’s begin! It completely does not matter what online-project you are willing to create – a portfolio, business website or blog. Together with this WordPress theme, you will get everything you need to launch a website that you have been always dreaming about. Its attractive and easy-to-customize design will certainly meet all your requirements. Artic is a catchy and handy template powered with the latest Moto CMS 3. It’s accurately designed to highlight a business atmosphere of a website. You won’t lose a minute working with it! The most difficult work is already done. The process of website creating can be really exciting when you deal with templates like Gravitas. It’s a powerful Moto CMS 3 product made to suit any kind of business. Moreover, this layout is supplied with an e-commerce plugin. So, you don’t need a big team of web specialists to start your own online store. Choose this WordPress theme and got a new-fashioned website for your business already today! It’s already packed with ready-to-use pages for different areas of business. Due to built-in Elementor and JetElements you can create very interesting effects without extra skills or programs. AlpenHouse may be a startling variant to choose if you are looking for real estate themes for WordPress. It’s powered with WordPress technologies. That guarantees you multi-functionality and safety of your spare time. Yes, you can achieve good results creating a website with this theme. Even without coding skills! Let everyone know about your news portal (or maybe you run a blog?)! 24.Storycle is a perfect WordPress theme that let you create an attractive and mobile-friendly website. There is no need to ask for the help of professionals just manage it by yourself! Prioris is an elegant WordPress theme. Don’t miss it if you want to represent your consulting agency at the most favorable light. Any of your ideas can be visualized easily and quickly due to this theme. 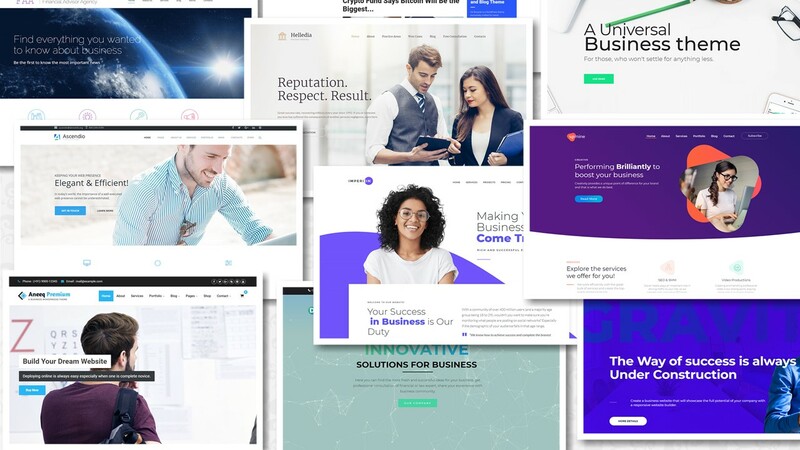 Evolution Business Moto CMS Template is designed with the dominance of cosmic elements to represent your innovating projects! 120 ready-made blocks are also included for your comfortable work. Don’t hesitate to check it! Choose this fully responsive Moto CMS 3 template and bring your business to the next level! Be sure that your website visitors will enjoy realistic Parallax effects and the page speed. More than that this theme comes with different contact forms, social integration and far more. Meet Consor! It’s a robust multifunctional WordPress theme designed especially for an online presence of consulting business. That’s why lots of attention is paid to its inviting visual quality. Without doubts with this theme, your website will be also provided with the variety of useful and easy-customizable elements. Go ahead to check it! To make a website with Royal Villas is an efficient way to promote your hotel business or travel agency. Spending no time for coding you can get a modern solid website with the strong built-in working forms (like booking, contact, and newsletter subscription) and the elegant design. Upmine is an eye-pleasing WordPress theme for digital agencies. The process of its installing and customization won’t take a lot of your time, as the toughest work is already done. Enjoy Upmine advantages and add a bit of your personal touch to make a really remarkable website! Dividenz is a user-friendly WordPress theme. It can perfectly feet your investment business and emphasize the brightest sides of your company. Dividenz is a good example that even without plunging into a code anyone can build a desirable website in a short time. Just check it on your own! Create a website for corporate use with Businessmen WordPress template and you won’t regret! This theme not only looks stylish but also can boast of multifunctional features. It’s designed in calm tones up to a business atmosphere. Law Firm is created for big law companies and small agencies. Due to it, your customers will value the clean and handy interface of your website. And you will like the latest Moto CMS 3 technologies that let moderate your pages quickly and easily. Bryte is a multipurpose WordPress theme. It’s packed with varied ready-to-use pages for any occasion. Each of them is also nice to look at. Don’t hesitate to check it! I hope you’ve enjoyed this set of alternatives for your business website. All of these themes and templates are modern and user-friendly. The only thing you need working with them is to add your own content to it. Still, you can “play” with colors, font styles, choose a gallery type and so on. Forget about coding skills! Lots of shortcodes and catchy widgets are already developed by professionals for your comfortable use. There is also no need to think about web hosting, search engine optimization, and other essential things that are required if you don’t use pre-made templates. Many thanks for your attention and good luck!